Does this not just scream summer to you?? Even better? It takes about two point five seconds to throw together, and will impressive the pants off anyone who happens to take at a gander at the miniature melon cups. While watermelon wasn’t always my favorite fruit growing up, the past couple of years, my taste buds have switched gears and now, I can’t get enough in the summertime. Plus, each time I practically eat my weight in watermelon, I feel as if I’m simultaneously receiving the requisite 60 ounces of water “they” say we’re supposed to be consuming daily, and I feel pretty good about that. Somewhere along the line, these low-key get togethers became full-on dinner parties, with each girl slaving away the day before or the evening of, preparing a gourmet feast for everyone. This season, we decided to take a back a notch and just provide a few nibbles and not a full meal….but, being a food blogger, this is extremely hard for me to do. My instinct when people come over is to feed them, a lot. So instead of cutting back on the quantity of food I prepared, I just scaled back on the effort the food prepared and tried to use up a few items I had sitting in my fridge – a solid compromise in my opinion. These watermelon cups were the first thing that popped into my mind, first of all they’re right in line with summer and with only three real ingredients to purchase, this adorable appetizer comes together in no time and won’t cost you a fortune. I start by taking a whole watermelon and cutting it into about two-inch slices, I then use a 2-inch biscuit cutter (you could also use a cookie cutter, but it won’t be as tall) and cut each slice into three or four circles. The insides are removed with a melon baller and they’re ready to be filled. Here, I went the simple route using the scraps of the cut watermelon, some diced cucumber and crumbled feta cheese. The mixture is tossed simply in a little bit of red wine vinegar, good-quality olive oil and just a touch of salt and pepper for seasoning. Not pictured: Right before the girls arrived, I drizzled each salad cup with a little bit of Trader Joe’s balsamic glaze, a recommended, but not required final touch. I tried them both ways, and each were equally delicious, so if you have it on hand, great, if not, don’t worry about it. Serve on a pretty white platter, and you’ve got yourself summer on a plate. These adorable watermelon salad cups are perfect for summer entertaining! Cut watermelon into two-inch sliced. Using a cookie cutter or two-inch biscuit cutter, cut watermelon into circles. Use a melon baller to scoop out the inside of the watermelon. Diced leftover watermelon. You need about ¾ a cup, reserve the rest for snacking. 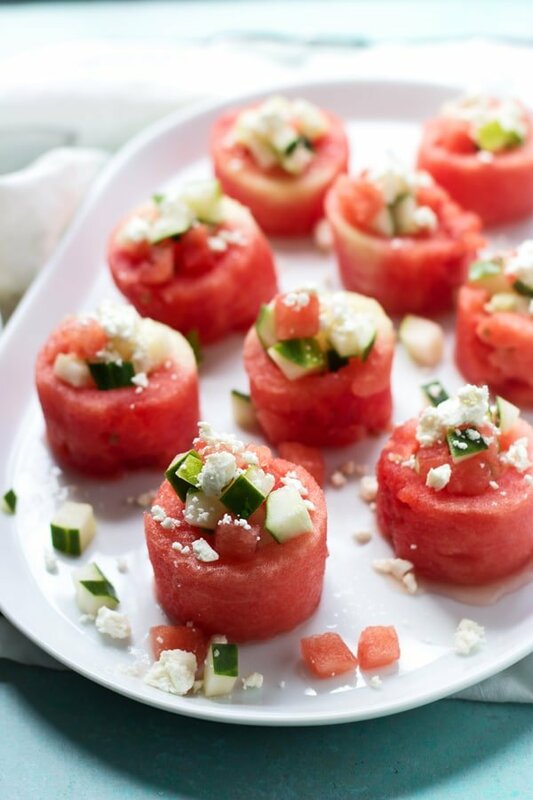 Toss diced water melon, cucumber and ½ cup of feta cheese with red wine vinegar and olive oil. Season with salt and pepper. Fill cups with watermelon and cucumber mixture. Sprinkle with remaining feta cheese. If wanted, drizzle with balsamic glaze. 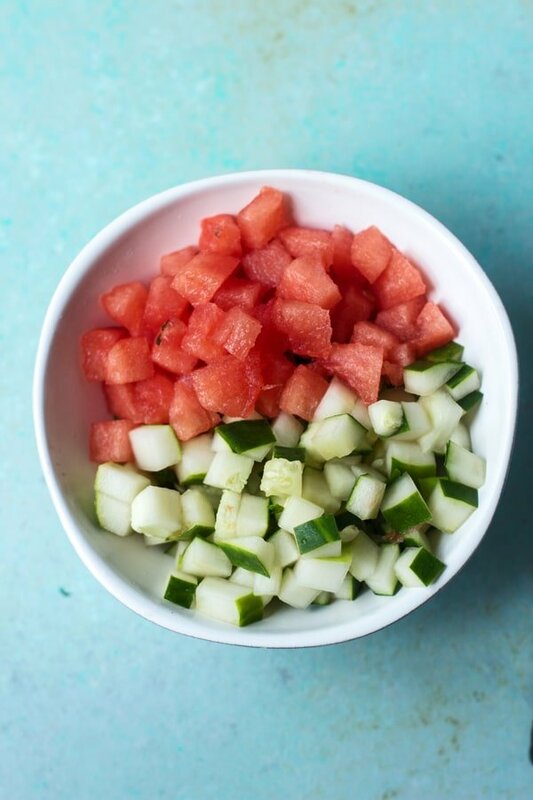 39 Responses to "Watermelon, Cucumber and Feta Salad Cups"
This is one of my favorite summer combos! I love how you served them, so summery! I can’t resist anything mini! Ah! These look so good! I’m having a *minor* feta obsession right now and I am soooooo adding this to my list of feta-y things to make this week. Also – watermelon cups?!? I’m pretty sure you’re a genius. Watermelons Salad Cups!! So creative, refreshing and perfect for summer! Loving it! What a cute little dish you put together here! The colors and flavors balance each other out so well! Great idea! These are just about the prettiest cups, Nicole! 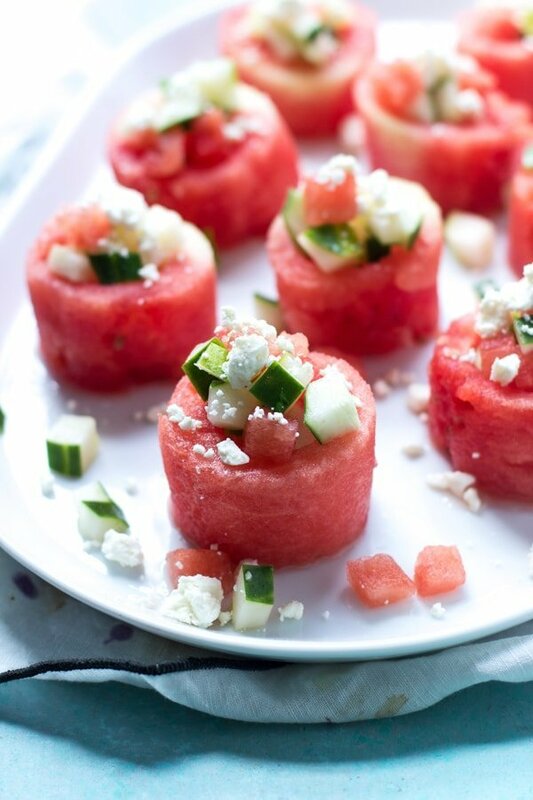 I love the combination of watermelon and feta. Sounds so refreshing! I totally want to come to your bachelor parties! I’ve convinced the hubs to watch it with me. and he totally gets into it, but it’s just not the same watching with a dude! BUT, these cups? HELLO fresh and delicious and so pretty! Pinned! Wish you lived here! Definitely not the same watching it with a guy! Thanks love! What a gorgeous salad, my dear! I love how cute they look 😉 So fun!! Pinned! Aren’t they adorable?? Thank you!!! These are the perfect summer appetizer! So fun and pretty, just love them! Also, I totally want to join your Bachelor parties. Oh no fair! I want to go to a party like that, too!! How fun! As is this salad! I LOVE the cups-idea! These are so cute!! 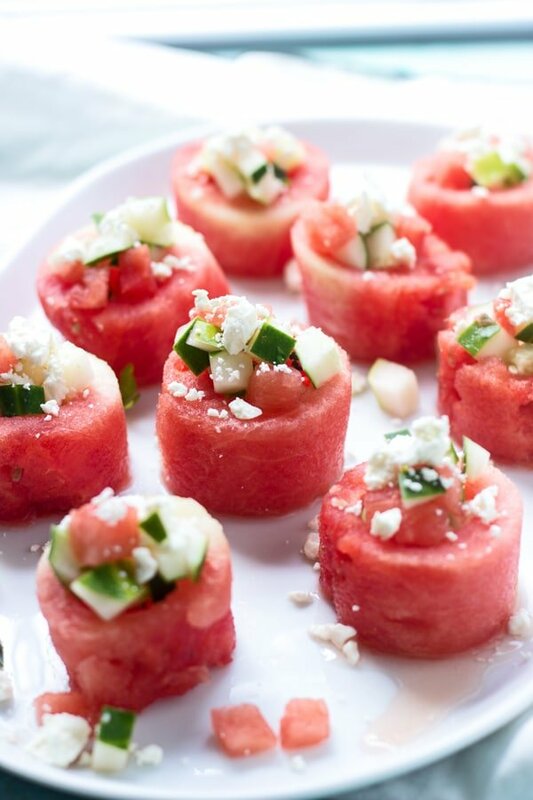 Love watermelon with feta. These look like the ultimate summer appetizer. SO stinkin’ CUTE!!! These make such a statement, I love them! My latest post also vents about the Bachelorette and the d-bags fighting over her & her hot pink duck lips! 🙂 It’s so bad but I just can’t look away! Yesssss to all watermelon! haha I am definitely eating my weight in it right now. Love these little cups! So impressive but easy which is awesome. I had my first watermelon of the season over the Fourth of July, and now I am addicted to it every which way. These are gorgeous, and perfect for girls night or any night! What a cute little app!! Oh my gosh if this isn’t the CUTEST summer appetizer, I don’t know what is! 🙂 These are super cute and so creative, plus the flavors I’m sure are the best! This this so refreshing and delicious, a perfect combination for the summer! I’m definitely going to have to give these a try for my next party. Your pictures are great as well! This is my ideal summer appetizer! Love watermelon, cucumber and feta together. The only thing that could make these better for me is a bit of mint! These look so cute and yummy. Thinking of making these for my niece’s bridal shower. Can I make them ahead and transport them? Yes!! I would make the watermelon cups, then make the filling separately and then assembly right before! You could also just make them ahead and hope the filling doesn’t fall out!